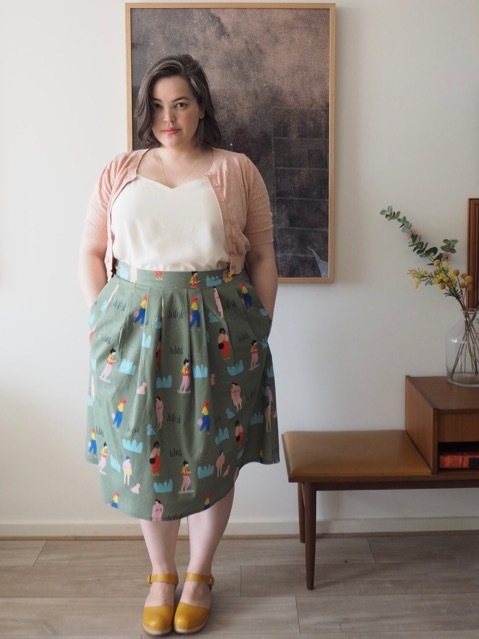 Megan Nielsen’s Brumby skirt pattern has been getting a workout from me, ever since my wonderful friend (and much more accomplished sewist) Laura sent me a fat-hacked version that she’d created from the original straight-sized pattern. 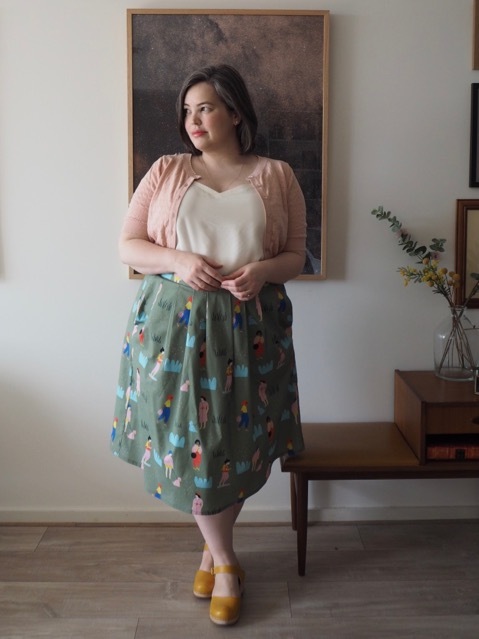 I was absolutely thrilled when Meg got in contact to let me know that she was extending her size range up to a size 30, and that the new collection would include a versatile skirt pattern, jeans, a sweater, and an asymmetric dress. 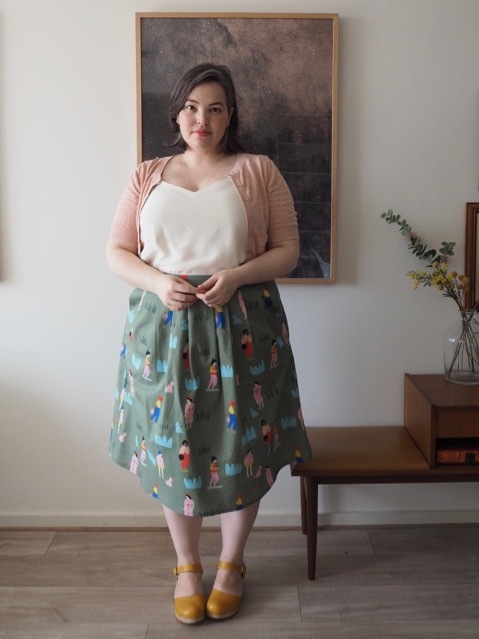 Megan Nielsen is an independent Australian pattern company based in Perth, and Meg’s blog is well worth a visit, especially for the in-depth sewing tutorials. Meg offered to send me a couple of patterns to try, and I jumped at the opportunity to give the Wattle Skirt Pattern, and Jarrah Sweater a whirl. 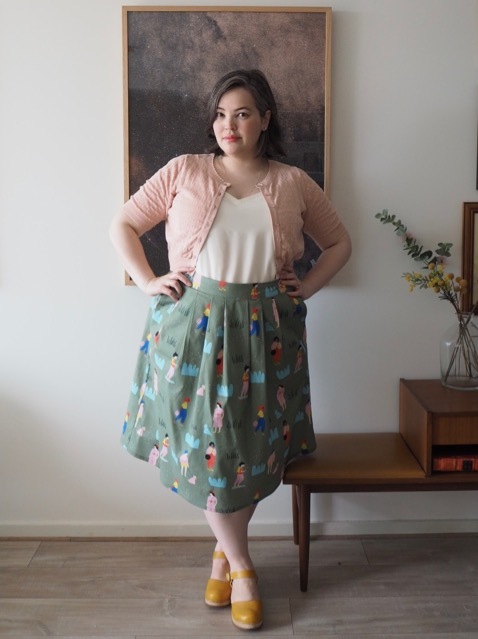 The Wattle Skirt pattern comes with a variety of different options: a bias-cut, pleats, gathers, and either a button fastening or a waist sash. All of the patterns feature an unusual crossover closure at the side seam (perfect if you loathe inserting zippers), and great big pockets (hooray!). 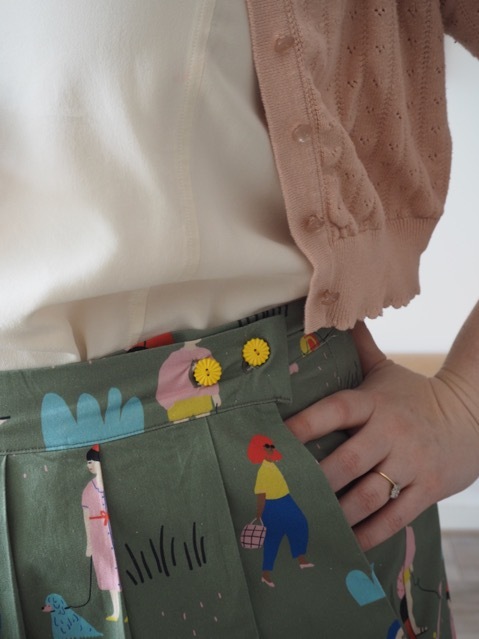 I decided to make the pleated skirt with the button closure out of some absolutely amazing new yardage from my favourite fabric company, Nerida Hansen. Last year on Twitter I was bemoaning the lack of cool, contemporary textiles designed by independent designers and available to buy in meterage. There were stacks of amazing textile designers doing fabulous designs, but of course almost none of them went above a size 14., and not one of them replied to my emails asking whether they’d be prepared to sell me yardage to make my own. I chased down rumours of bolts of leftover Gorman fabric available at a shop in Melbourne (a fairytale, as far as I can tell) and of course, there was Spoonflower, but the quality never quite lived up to the price. I can’t even remember how I stumbled across Nerida Hansen – Instagram probably – but when I clicked through to her site, I realised that this, this, was what I had been dreaming of. Independent artists, cool designs, lots of Australian content, and natural fibres like cotton, linen, and silk. I’ve bought from Nerida Hansen several times now, and everything I’ve received has exceeded my expectations. The colours are bright and vibrant, the fabric quality is gorgeous, and the customer service has been outstanding every time. Be quick though – styles run out very quickly, and I’ve missed out of designs more than once by vacillating over them. For the Wattle skirt I had a couple of meters of mid-weight cotton fabric deigned by French artist Jennifer Bouron. It features a cool print of women walking in the park on an olive green background, and I love it. The skirt itself was fairly easy to make. It’s the same simple, boxy shape of the Brumby, with deep slashed pockets at the side seams. I may have slightly underestimated what size I needed around the hips, so the pleats pull a little at the rear, and next time I would definitely follow the size chart (rookie mistake) and sew the larger size. I adore the button fastening at the waist (I especially adore the part where it meant I could skip the zipper), and I’m really happy with the cheery yellow buttons I used. 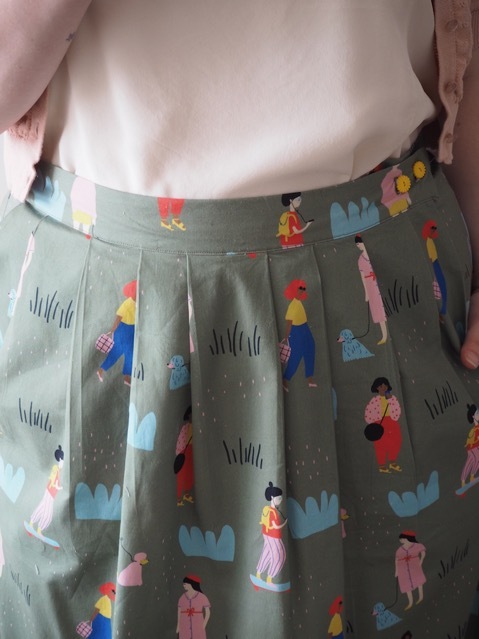 The tutorial for the Wattle Skirt isn’t available just yet, but it’s a fairly straightforward project if you can’t wait, and the instructions that come with the pattern are illustrated and easy to follow. It has been such a pleasure to get back into my sewing again. I’ve been experimenting with some new patterns, having a go a frankensteining some of my own, and dusting off a few old favourites.This is one of the latter. 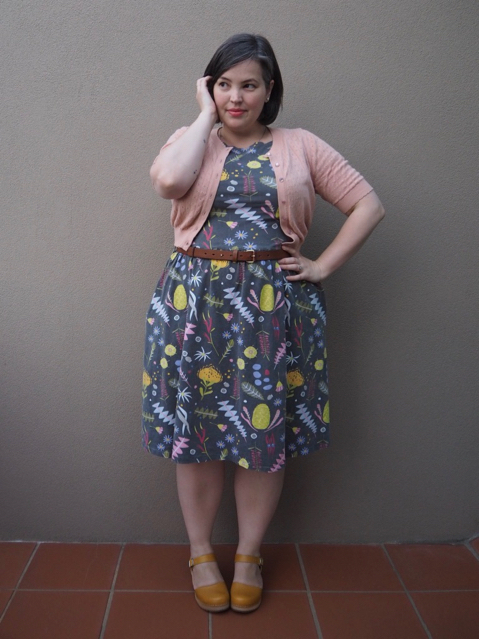 I’ve made, er, I think five Moneta dresses now: Black cats, cockatoos, whales, a plain black one, and now this one. The pattern is starting to get that really fragile feel to it, so I’m going to have to transcribe it onto new paper if I want to keep sewing it. Which, obviously, I do. Since Gorman‘s collaboration with Australian artist Dana Kinter I’ve been on the look-out for fabric that features native floral motifs (ideally from an Australian artist). If you follow me on Instagram, you know that I recently discovered the mother-load with Nerida Hansen (oh my God, more on that in a future post), but for a knit fabric it’s really Spoonflower or bust. I’ve had a lot of luck with Spoonflower in the past – it’s expensive, but the range is unparalleled, the quality is fine (usually), and artists from all over the work can sell their designs there. 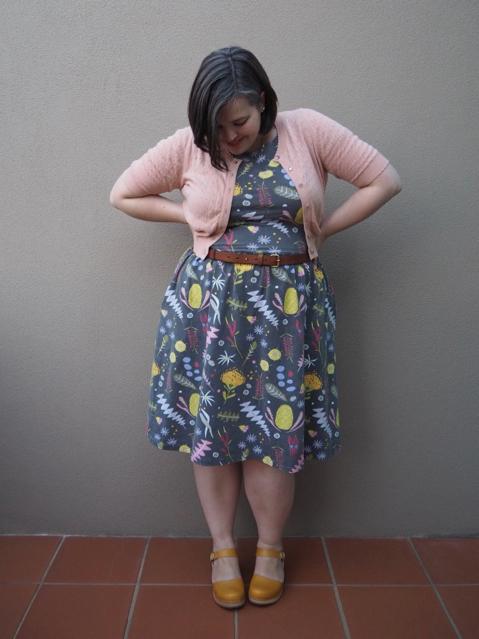 The fabric that I picked for this version of the Moneta dress was from Kara Cooper of Mount Vic and Me. It’s a gorgeous graphic design that features brightly coloured Australian wildflowers, gum nuts, and blossoms and leaves on a rich black background. Errr…. that’s a black background. Guys? Black? This is not a black background. And this is not the result of overzealous washing either, it arrived in my mailbox this colour. And, look, it’s fine. And I’m pretty sure it’s just the fabric that I picked (cotton-spandex jersey, for the record), but I’d be lying if I didn’t admit that I was a bit cross. I don’t think I’ll be buying another black-pigmented fabric from Spoonflower again, or at least not in the cotton jersey. 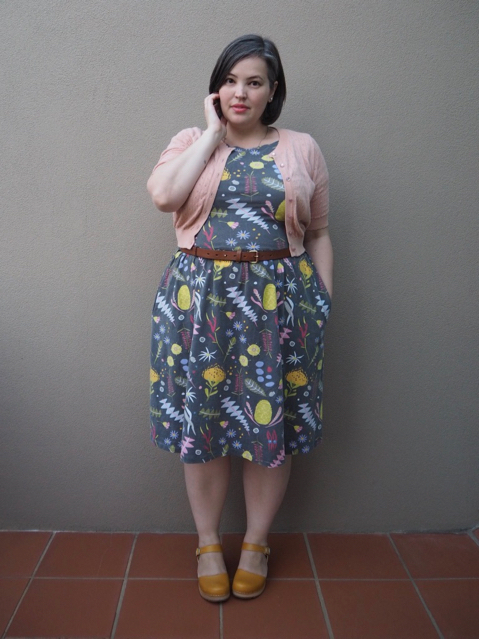 Still, the design is everything I hoped it would be, and once I got over my disappointment I realised how nicely the muted colours worked with a blush cardigan (or a yellow cardigan, or a grey cardigan). And it goes beautifully with my new yellow clogs. I bought a pair of Swedish Hasbeen clogs a good five years ago from Modcloth, and I’m embarrassed to admit that I can probably count the number of times I’ve worn them on one hand. I knew they were going to be a commitment: You have to break them in, the internet told me, then they’ll be the most comfortable shoes you own. And I tried (sort of) but they were so uncomfortable after such short periods of time that I never got past the breaking-in stage. I’d heard better reports from people about Funkis clogs, so when the team at Funkis Melbourne offered me a pair to road-test I thought I’d give them a whirl. 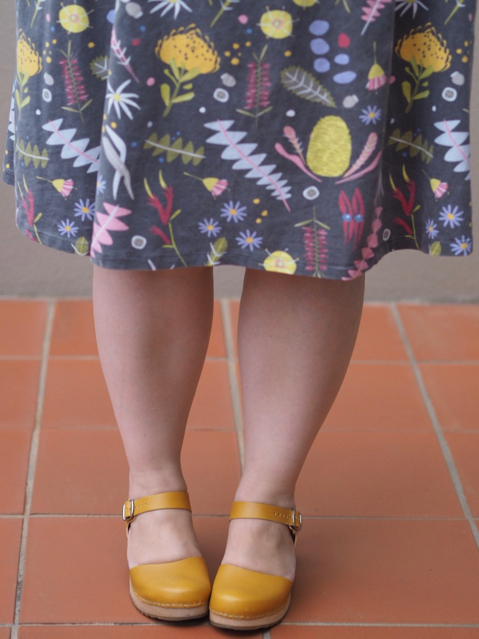 I got the Gertrude clogs in the mustard colour in my usual size 39 and guys, they’re great. Everything that I’d hoped for from the Hasbeens and more. They have a thicker rubber sole than the Hasbeens, and I can barely feel the road through them when I’m striding. The thicker sole also means that you don’t get as much of that unmistakable clop-clop noise that usually accompanies clogs. The leather is a little bit softer, and softens more quickly, and they seem a little wider in the foot, which is good for me. The strap’s just a teensy bit shorter than I’d ideally like, but it’s loosening a bit with wear and I have very high arches, so it might not be an issue for many others. The first day I wore them I packed a spare pair of shoes (just in case) but it turned out I didn’t need them. They were perfectly wearable from the first step, and only started rubbing a little by the end of a hot 9 hour day. Every day that I’ve worn them since they’ve been more and more comfortable. In fact I’m so enamoured with them I’m pretty tempted to treat myself to a second pair. What do you reckon? The Josefina, or the Tilda? Or both?